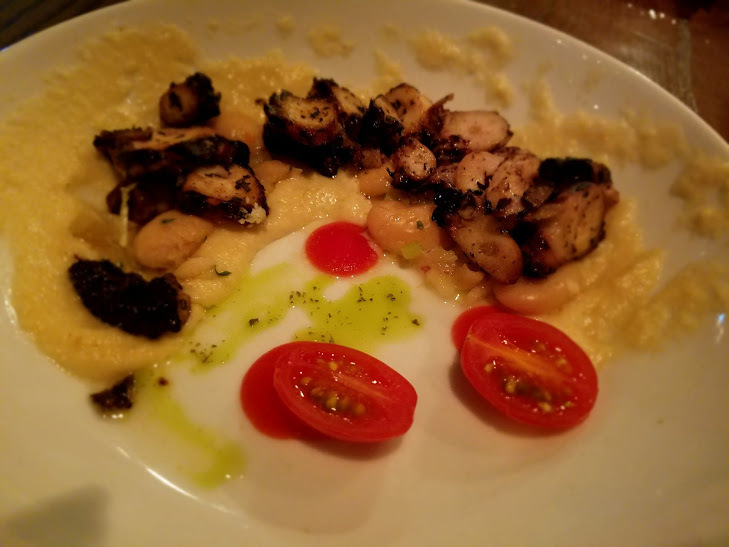 Our next choice and one of our favorites the Rosemary Grilled Octopus with white beans, tomato, red onion, fennel drizzled with basil oil. The sliced octopus well grilled and tender to the bite, flavor from the combination of fennel and basil oil complimented the beans, all around a satisfying choice. 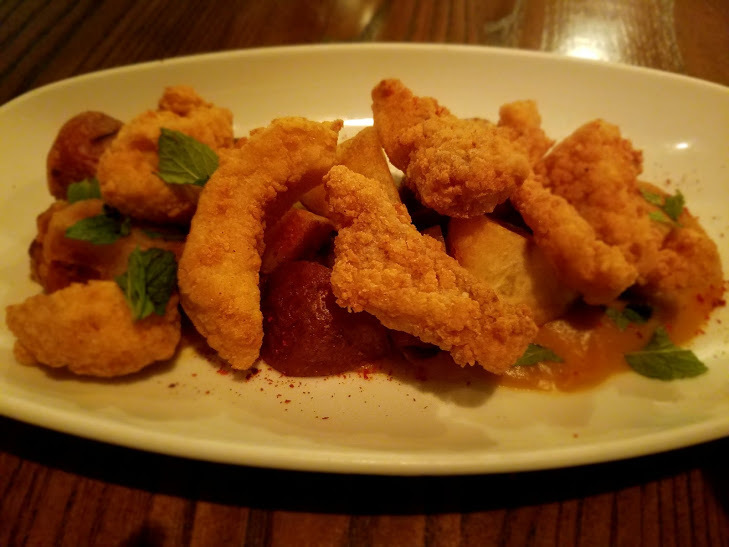 We then tried one of tonight select appetizers, the Grouper Bites, served with crispy roasted red new potatoes. I was somewhat disappointed with this dish. The potatoes we very crisp on the outside, but the potato meat itself was well cooked and pleasant in the mouth, grouper bite-sized pieces cooked to a golden brown, although tender and moist, lacked flavor. I added salt, but it was too late to save this dish for me. 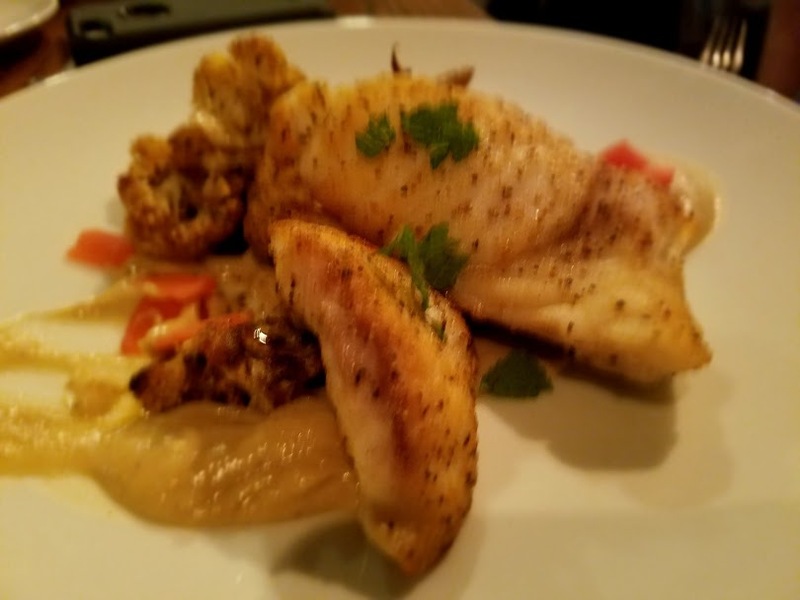 We both chose from the specials of the night, my companion selected the Snapper, with Blackened with Pureed Cauliflower. A perfect recovery from the grouper, fish well seasoned, tender and moist. The cauliflower two ways added another level to the vegetables. 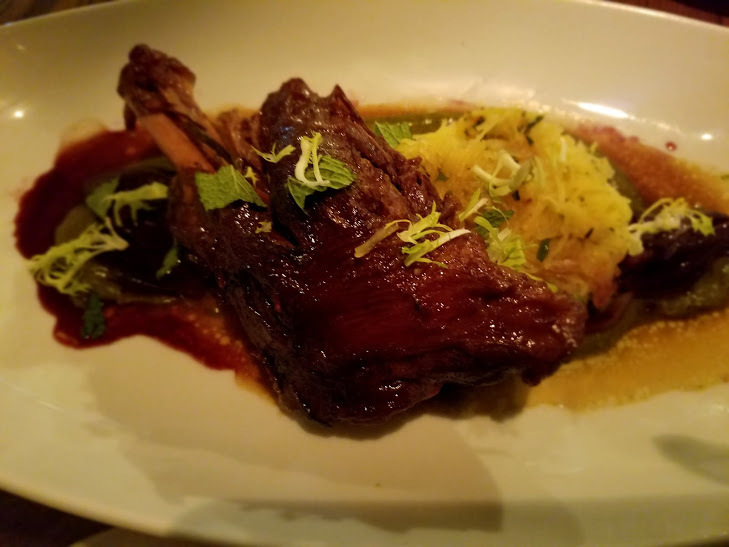 I selected the Braised Lamb Shank with Roasted Onions, Spaghetti Squash with Harissa. This dish unusual and outstanding, the flavors of the hot chili from the harissa infused everything, yet did not overpower the sweetness of the spaghetti squash. 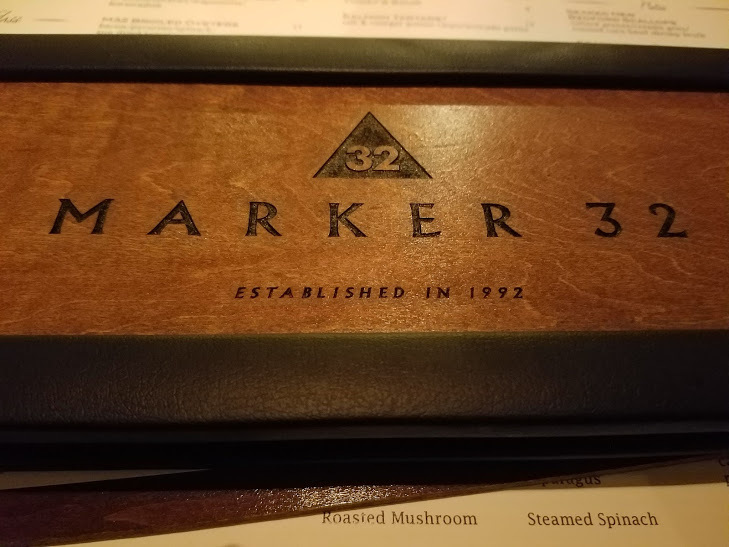 Marker 32 is a must try restaurant, casual yet classy, locally sourced food when possible, locally owned makes it a place I want to support. 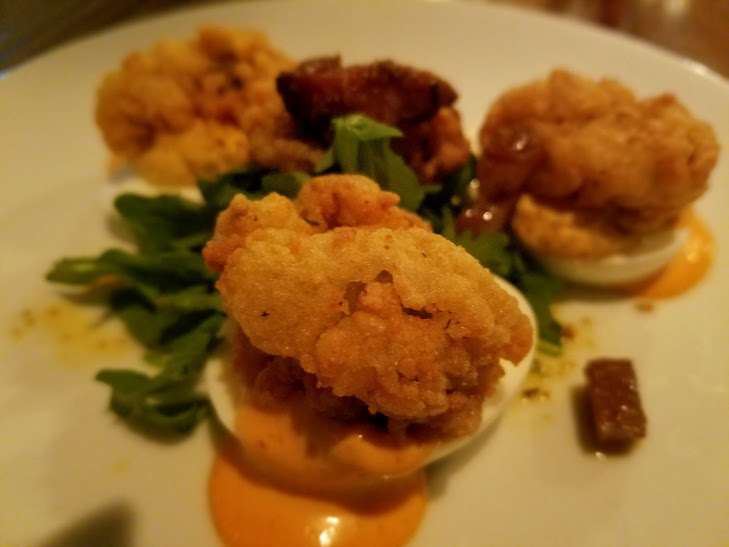 Get the besties together, start with a few adult bevies, then treat yourself to the food you will not find on any menu around. I do advise leaving the kiddies at home for this one. 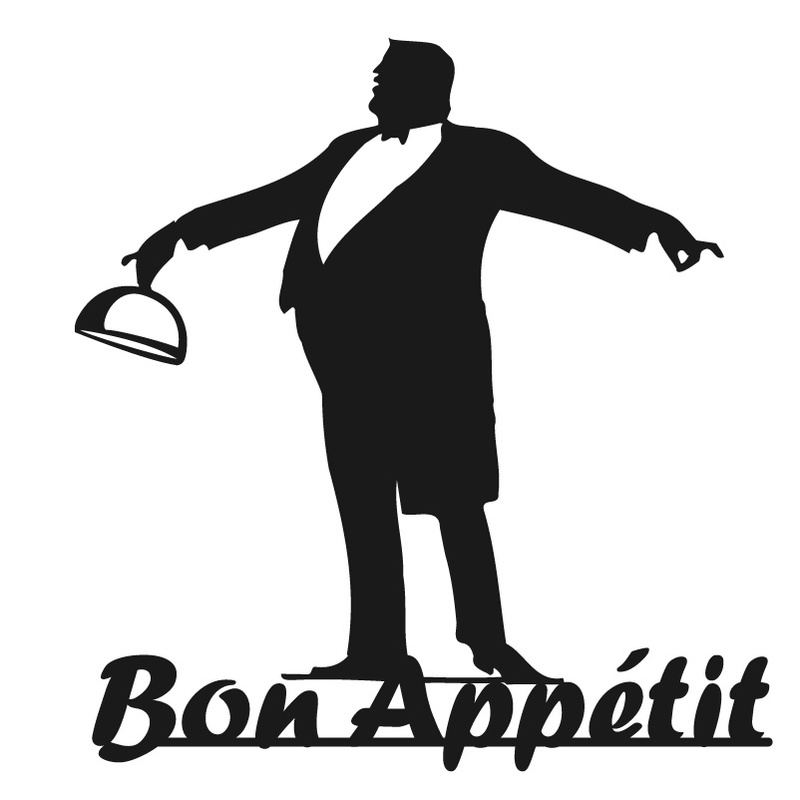 I suggest reservations.